Fears of Jeremy Corbyn becoming PM are driving the EU to take a hard line in Brexit negotiations, it was claimed today. Brussels is insisting on a ‘level playing field’ mechanism to prevent a hard-left UK government nationalising large sections of the economy and subsidising industry. The level of anxiety was underlined as Tory infighting over future trade links with the EU intensified. Environment Secretary Michael Gove has risked fuelling by endorsing a Twitter thread by former aide Henry Newman that condemned Theresa May for trying to ‘resurrect the corpse’ of her plans for a customs partnership with the bloc. The intervention came after Business Secretary Greg Clark was sent out by Downing Street to argue for continuing close customs links. However, despite the raging row within government, EU sources have told The Times their main concerns centre around Mr Corbyn’s demands for exemptions from basic free market rules. In a speech earlier this year, Mr Corbyn said he wanted ‘protections, clarifications or exemptions’ from restrictions on ‘state aid’ for industries. The Labour leader said he would not be held back ‘from taking the steps we need to support cutting-edge industries and local business, stop the tide of privatisation and outsourcing’. The EU has now laid down requirements for a ‘level playing field’ that would hit Britain with trade tariffs, fines and even grounding of flights if the UK subsidises industry. The source said the real cause for the punishment was not fear of deregulation, but Labour’s protectionist plans. ‘If a Corbyn government implements his declared policies the level playing field mechanism will lead to increased costs for Britain to access the single market because of distortions caused by state aid. That is why this is where the real battle is,’ the source said. Foreign Secretary Boris Johnson, Brexit Secretary David Davis, Trade Secretary Liam Fox, Home Secretary Sajid Javid, and Defence Secretary Gavin Williamson all lined up against the hybrid ‘customs partnership’ model at a meeting of the Brexit war cabinet last week. There was speculation they had managed to ‘kill off’ the proposals after Mrs May ended up in the minority at the showdown. But Mr Clark made clear the idea had not gone away yesterday – and also opened the door to extending a transition period on customs with the EU. What is a customs partnership with the EU? A customs partnership is less formal than the current EU customs union the UK is a member of. Under the proposals, Britain would stay in a customs union with the EU for some sectors, while leaving it for others. This would mean it would impose the same tariffs as the Brussels bloc on some goods, but set its own on others. Backers of the plan say his would facilitate free trade in areas where Britain does a lot of its business with the EU, while freeing the country to sign new free trade deals with other countries. One possibility could be keeping the UK and EU in a customs union for trade in goods, but allowing divergence for the services sector. Under the so-called ‘hybrid model’, the UK would collect EU import tariffs on behalf of Brussels and then pay it to the EU. But Brexiteers are critical of the plan. which they think is unworkable and cumbersome. They fear it will effectively stop the UK from being able to negotiate free trade deals around the world after Brexit. Mr Clark said it could be a case of implementing a new customs arrangement ‘as soon as you can do’. Mrs May is now believed to be planning to bring a ‘rebadged’ version of the plan back to the powerful Cabinet sub-committee, after warning ministers that it is the only way of getting parliamentary approval for a Brexit deal. If there is still resistance she could opt to bypass the sub-committee altogether and take the decision to full Cabinet, where she has more allies. 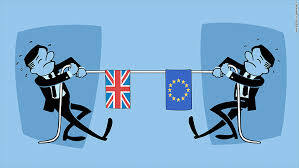 The idea – one of two Britain placed on the negotiating table last year – would in theory create close enough ties with the EU to avoid a hard border in Ireland and still allow Britain to strike trade deals. But there are no similar agreements elsewhere in the world and Brexiteers fear it will be used as a ‘trojan horse’ to effectively keep Britain inside the full customs union, sabotaging any new trade deal. The other British option is to streamline the UK-EU borders as much as possible but accept some checks as the price for striking new trade deals. Brussels has already rejected both proposals. Mr Gove tweeted that his former aide Mr Newman – now director of the Open Europe think tank – was ‘always worth reading’ and views on customs arrangements were ‘v helpful’. Mr Newman said if Number 10 sought to pursue a version of the customs partnership, ‘they will be putting all their eggs in a broken basket’ and it was ‘far better to accept some friction on trade’ and pursue the ‘max fac’ model. WHO’S IN BREXIT WAR CABINET AND WHERE DO THEY STAND? Seen as one of the main advocates of ‘soft’ Brexit in the Cabinet. Has been accused of trying to keep the UK tied to key parts of the customs union for years after the transition ends. He is unhappy with plans for a tight customs arrangement with Brussels – warning that it could effectively mean being lashed to the EU indefinitely. Has buried the hatchet with Mr Johnson after brutally ending his Tory leadership campaign in the wake of David Cameron’s resignation. He has said the government will be seeking a ‘Canada plus plus plus’ deal from the EU. Another Brexiteer, his red lines are about the UK’s ability to strike trade deals with the rest of the world, and escaping Brussels red tape. On the softer Brexit side of the Cabinet, Mr Clark has supported Mr Hammond’s efforts to maintain close links with the customs union. A close ally of the Prime Minister and viewed by some as her anointed successor. He is believed to be siding with the Brexiteers on customs arrangements and the need for Britain to be able to diverge from EU rules.